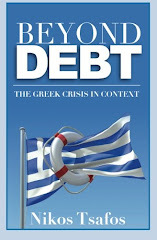 As a Greek living in Washington, DC, I am fated to spend much time reading about debt and default. Having lived in both countries, I find the notion that America's fiscal troubles somehow resemble Greece's to be ridiculous (see here). And yet as someone following two parallel debates in Greece and the United States, I cannot help but think that Greece is having a serious debate about government spending, while America is not. Readers of this blog will note that I have criticized Greek politicians for failing to have a serious debate about debt – so how can I now say that Greece is having a serious debate? In fact, my critique is that they are failing to discuss honestly the origins of Greek debt and its foundation in the post-1974 political economy. I criticize them for blaming speculators when our problems are homemade. And I blame them for limiting their agenda to a “we should not default” platform and thus missing out a chance to challenge Greeks to do better (here and here). The United States, by contrast, is having that “historical” debate aplenty – look, for example, at a graph released by the White House trying to apportion blame for the country’s debt between Bush, Obama and “other.” There is more than enough talk about how the country got into its current position – too much in fact. But there is not enough debate about what comes next. In truth, the US debate on raising the debt ceiling is just silly. Let me explain. Imagine that America was a family spending beyond its means. What would happen? The family would get together, look at the numbers and ask itself two questions: “what can I live without” and “where am I spending too much relative to what I am getting?” From time to time, the US asks itself question number one. But it never really asks the second one. Perhaps the best example is military spending. In theory, a debate on military spending would entail two questions: what is role of the military relative to other institutions in national security (relative to diplomacy, alliances, multilateral institutions, police work, etc. ); and how much money should be spent on defense? Instead, in Washington, there is a group of people who think national security is directly linked to spending: more spending means the country is more secure, period. Of course, this is a preposterous belief: it ignores whether the money is well spent. This is akin to spending $10 rather than $5 on the same cup of coffee and yet somehow thinking that you got a better coffee just because you spent more. Pretty silly. And yet this is exactly the debate America is having. Two parties are asking whether the country should spend more or less without asking what it gets in return. The spending debate is devoid from the “results” debate. It’s like asking whether the family should spend $100 or $200 less a month without asking what it should be spending it on. If America were having this debate, it would soon realize it’s no debate at all. As I noted before, America’s fiscal problems are trivial relative to Greece’s: all that America needs to do is cut healthcare spending, which it can without compromising health outcomes. Greece, by contrast, is having this debate. I have no intention to idealize this debate, of course; it is not perfect. But it is still a debate around big questions: how big should the public sector be? How much should public sector employees be paid and how many should we have? How many companies should the state own? What assets should stay in state hands? How much should professions be protected, how and why? What is the role of the state versus the private sector? These questions are integral to a true debate because they link spending levels with results – they are asking now just “how much” but also “on what and with what results.” Not a perfect debate, to be sure, but a good start. Of course, it took Greece having to stare catastrophe in the face to have this debate. Hopefully, America will get there sooner. It has to.